Clouds provide a clue if a severe thunderstorm or tornado is coming. One clue is inflow band clouds. But what is an inflow band cloud? How does it look like? When and where can it be seen? Find the answers in the succeeding paragraphs. Inflow band clouds are lines of clouds moving toward the updraft zone of the thunderstorm, usually from east to south. It is also referred to as feeder band streaking from the utmost edges of the hurricane as it pulls moisture from the ocean and feed the clouds of a thunderstorm. It therefore provides a clue on the strength of the moist air being fed into the thunderstorm. If it exhibits a curved or spiraling pattern, it suggests a cyclonic rotation indicating the existence of a mesocyclone and a sign that a tornado is about to occur. At What Height is Inflow Band Clouds Found? Inflow band can be found at the lower and middle cloud levels. This means that it can occur from 6,000 feet to 18,000 feet above the Earth’s surface. These clouds suggest that the thunderstorm is gathering moisture from the surrounding air. Inflow band clouds come in several forms depending on which atmospheric level it appears. Here are some common classifications of inflow band clouds. Inflow band may take the form of Beaver’s Tail which is characterized by a flat and broad appearance that resembles a beaver’s tail. Beaver’s tail is connected to the main updraft of a thunderstorm whose base is found at elevations close to the base of the thunderstorm’s main updraft. As the strength of inflow changes, the shape and size of the Beaver’s tail also changes. Inflow stinger is another way inflow band clouds can appear. This form closely resembles a beaver’s tail that has a stinger-like structure. When inflow band clouds develop in the middle cloud level, it exhibits a striated form of inflow band. How do Inflow Band Clouds Form? Inflow band clouds form due to the condensation of air inflow drawn into the thunderstorm. The air inflow is rich in moisture gathered from air around it; as moist air condenses, it forms into bands of clouds. A well-defined inflow band cloud signifies that the thunderstorm is feeding and strengthening. A spiraling inflow band suggests that the thunderstorm is rotating making it favorable to form tornado or hurricane. What does an Inflow Band Cloud Look Like? Inflow band clouds appear as irregular bands or lines of low cumulus clouds moving into the main updraft of a thunderstorm or hurricane. If there is rotation, this cloud formation exhibits a spiraling band of heavy cumulus clouds. How common are Inflow Band Clouds? These clouds are very common whenever a severe thunderstorm develops. Although thunderstorms may strike at any geographic location, severe thunderstorms frequently occur at middle latitude regions. This is because warm and cold airs meet at middle latitude making it favorable for thunderstorm formation. 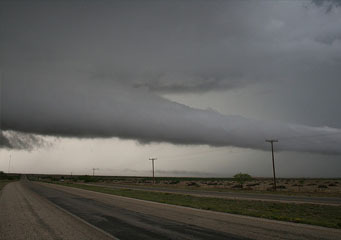 In the U.S, inflow band clouds are commonly seen in places where tornadoes frequently occur. Inflow band clouds maybe indicative of thunderstorms or tornadoes. So if you see these clouds, be prepared and take cover.